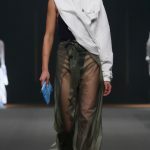 Monday evening’s 12th edition of Swiss fashion platform Mode Suisse included the acclaimed and passionately colourful presentation of Central Saint Martins alumni Kévin Germanier and enSoie/Julian Zigerli’s unisex “see-now-buy-now” capsule collection-collaboration «eSJZ». Mode Suisse first-timers COLLECTIVE SWALLOW, Ladina Steinegger feat. 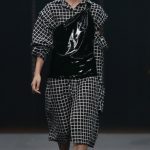 SOL SOL ITO and WEER were able to introduce their fashion to a wider audience of professionals as menswear designers Garnison and Adrian Reber certainly kept their fans. 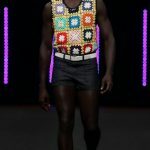 Models Tamy Glauser, Fallou Gueye and stars-in-the-making Audrey Bousquet and Lilith Foehn walked for the always well-anticipated HEAD – Genève show block and brought flowers to the catwalk for the delicate universe of Lida Noba. Mode Suisse had already sent out the DE NIZ · CHRISTA DE CAROUGE-models down the catwalk, installing them in a zen-like art installation style as guests took their seats – the perfect introduction to the show which was opened by YVY and her talk-of-the-town leather pieces, simple dresses and kimonos. To round off the show, de Sede has chosen to launch their inaugural leather bag collection as a world premiere on the Mode Suisse catwalk, with front row guests seated on their legendary sofa DS-600. The Mode Suisse organisation is aware that fashion looks fabulous on the catwalk but insists that it is at least as important to have a deeper and wider look into the industry and the independent designers’ needs: At yesterday’s 4th Mode Suisse TALKS/workshops, moderated by Sanjeev Davidson, experts including Voo store Berlin’s Herbert Hofmann, de Sede CEO Monika Walser, Schön! Magazine’s Raoul Keil and Mary Ma from the Textile Library in Hangzhou/China, discussed the upcoming DACH Showroom Paris (29 Sept – 3 Oct 2017, info@modesuisse.com), today’s buying and selling models now and beyond. Before hitting back with edition 13 in February 2017, Mode Suisse will remain in town with it’s «Sélection Mode Suisse chez enSoie», Strehlgasse 26, Zurich, until Sept 9 and «Sélection Mode Suisse chez SEPTIEME ETAGE», 10, rue du Perron, GENEVA, until (extended!) Sept 24, 2017. All this is possible only owing to support and patronage from generous partners Engagement Migros, The Zurich Silk Association ZSIG, The Hulda and Gustav Zumsteg Foundation and Swiss Arts Council Pro Helvetia, allies of Mode Suisse since Edition 10. Mode Suisse would also like to thank to edition partner de Sede and car partner Mercedes-Benz Switzerland as well as MAC Cosmetics, Oribe/Le Bal des Créateurs, hotel partner Renaissance Zürich Tower Hotel. Additional partners are Creative Zurich and 25hours Hotel Zurich. Artistic/show direction, organisation, media & production by Yannick Aellen & Nicolas Eberhart with their team.